Ever since Newark was settled and became more than just a handful of New England-style homesteads along Broad Street, the danger of fire has been a major threat. At the first signs of industrialization in the early 19th century, the tinderbox collection of frame and federal-style brick structures posed a danger to man and community. Fireproofing was unknown. Wooden shingles were quick to ignite when wind-blown cinders were spread by unfriendly winds. In 1797, nearly 500 Newarkers gathered outside Judge Elisha Boudinot's Park Place mansion to watch the great house burn to the ground. Newspaper accounts said the mansion could not be saved for 'want of proper fire implements such as engines, ladders, hooks, buckets and the like.' As a result, a fire association was established. Nearly $1,000 was spent to purchase fire hooks, ladders and buckets and two fire engines. But when the home of Major Samuel Haynes caught fire in 1800, only a handful of firefighters arrived. They fought valiantly but unsuccessfully to overpower the blaze that destroyed his home. On August 15, 1835, a fire started in the barn of Mrs. James A. Brittain. It also destroyed her home as well as the sash and blind factory located next door. One of the biggest blazes of all time, the great fire of October 27, 1836, nearly wrecked the Newark of the 1830s. This disaster began just as the weather was beginning to turn cold that year and homeowners were beginning to stock up on firewood. The city's total fire facilities were called into action, but soon the water supply was exhausted. For five hours, the fire burned out of control. Only through considerable effort were the State Bank, Old First and Trinity churches spared. While no lives were lost in the fire, the unemployment created in the wake of the calamity was felt by almost all Newarkers. With the establishment of the modern city came the creation of the Newark Fire Department, one of the nation's finest. We will give this important turning point in the city's history special coverage in the future. For the moment, however, we will look at some of the great fires and related disasters which have literally burned their way into the city's annals. When Newark's industrial potential began to develop, the city was ripe for problems, not only because of its many wooden buildings, but also due to the 'dangerous machines' or boilers that were becoming common in homes and factories. Combining an 18th or 19th century frame structure and an 'unstable machine' almost mandated a formula for catastrophe. Within the past century there have been innumerable fires that cost lives and lost property. The economic consequences resulting from these catastrophes greatly changed the city. On September 4, 1888, a fire started in the scrap room of the Celluloid Manufacturing Co. A gigantic sheet of flames spread across the street to a dozen nearby homes. Thirty people were sent to the hospital before the fire was brought under control. More than $100,000 worth of property was destroyed, a figure that would be multiplied many times over in today's prices. 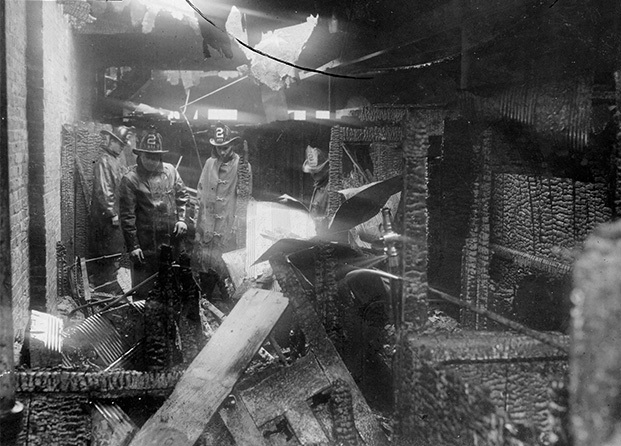 On April 23, 1904, a fire at Weiner and Co. at Mechanic and Lawrence streets caused a $100,000 property loss. Twelve companies—more than 100 men—were called in to fight the fire. One newspaper account noted: 'Clouds of smoke poured from the building as the flames found their way from the rear to the front…With precision, indicating training and experience, rubber-clad men in helmets were receiving and executing orders in rapid succession. But walls fell and the roof collapsed and without warning the western and southern walls came down upon a number of firemen, who had been fighting the fire from the roof of an adjoining building in Mechanic Street. These men were instantly entombed in the debris of brick and timber. The fire had now assumed large proportions.' Two men died instantly, a third later succumbed and 17 were severely injured. On February 27, 1906, the mercantile establishment of W.V. Snyder and Co. at Cedar and Broad streets resulted in 'one of the most spectacular battles ever fought by the Newark Fire Department,' according to a local newspaper story. The well-known Newark department store burned in a period of high winds and frigid temperature. The account further stated: 'Immediately, the sky became red from the reflection of the fire and some who witnessed this spectacle from distant points believed it was the Aurora-Borealis.' The fire was so severe that its flames scorched the giant elms across the street from the building in Military Park. Firefighters battled the blaze all night and into the next day as the conflagration endangered a good portion of the downtown business district. Among the 20 properties destroyed or damaged were the Jeffersonian Club, the Progress Club, and the New Jersey Business College. Damage was in excess of $800,000. October 20, 1908 was the date of Newark's first four-alarm fire. It took place at L. Goldsmith and Sons Trunk factory at Cherry and Canal streets, near the present New Jersey Performing Arts Center. The five-story brick building, 100 by 300 feet faced the old Morris Canal and employed 100 workers. One newspaper called this 'a memorable day for the Newark Fire Department, as this fire was the direct cause of 14 other fires, resulting in an epidemic of alarms that called out every piece of apparatus in the city.' As a result, the need for more water mains was recognized by city fire officials, as was the need for increased mechanization of firefighting operations. The 1909 Mills Hotel fire resulted in the death of six occupants. Consequently, Public Safety Director William J. Brennan began a campaign to improve public housing conditions at the city's lodging houses and hotels. The Mills Hotel at William and Halsey streets was home to 125 low-income residents. The fire, which broke at mid-morning, was caused by an incompetent employee of a disinfectant company. It caused $50,000 in damage as well as the loss of life. The long-term result of the fire was more rigid enforcement of code regulations. Sprinkler systems were installed in dozens of hotels, lodging houses, and semi-public buildings. Next Thursday we will take a look at other fires that made history in Newark in the early part of the 20th century.